I think that if fetal rights activists are ever going to make real strides in changing cultural attitudes about abortion and the unborn child, we will have to create a history of that subject from our perspective. So we have to create an archive of information about fetal history. 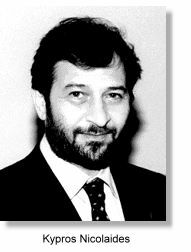 Kypros Nicolaides is a Cypriot-born British doctor who developed a number of pre-natal screening techniques, which, as we know, have led to a large number of abortions. He is not opposed to legal abortion. Note that when you hear of a "maternal-fetal medicine unit", chances are, abortions are performed there (including many late-term abortions. He worked at the first fetal medicine unit in the UK. He was the subject of a profile in the Jerusalem Post, which inspired this message. The sight through the primitive machine of a tiny fetus moving in its mother's uterus fascinated him so much that he began to wonder about the child's legal and philosophical rights, not just the medical situation. Ultrasound scans for pregnant women "caught on quickly. At first, there were questions about whether it might be harmful, as people were very concerned about health risks from X-rays. Today, there are questions about the safety of everything. Fetuses should be scanned with ultrasound only when it is necessary. Now there is routine 3-D ultrasound, and doctors have become photographers. I think there is some benefit of parents 'bonding' to a fetus before birth, but the availability of ultrasound in US shopping malls is wrong; it's just a way to make money." I also encourage you to read up on Ian Donald, the Father of Ultrasound. Ian Donald was an interesting fellow because he pioneered ultrasound technology and campaigned against legal abortion in the UK in the late 60's under the aegis of the Society for the Protection for Unborn Children. However, he was not opposed to all abortions, and chances are he probably performed a few himself, so his legacy is very mixed from the pro-life perspective.